Yesterday I was over at Gyllenbabble looking for any news I was missing (because in all my years as a fan, I have never learned how to look up anything for myself), and I ran across this recipe for meatballs, supposedly written by Jake Gyllenhaal, supposedly uploaded to "Hollywood & Dine" for no apparent reason (other than that Jake is so hot right now, ergo who wouldn't want to know about his meatballs?!). Obviously, having seen the recipe, I immediately had to try it. So I'm going to blog as I cook. Here we go! I made these to be added to tomato sauce to be served over pasta. 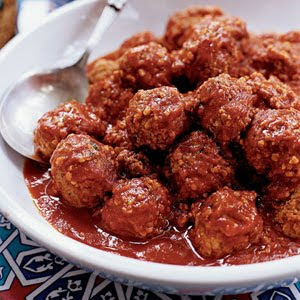 You can also make these in smaller sized meatballs to be served as an appetizer. Appetizer? Um, no. Besides, it'll be a miracle if I get through the main course the way these directions are going so far. I went through my kitchen and found about half of these things. And by "half," I mean I had eggs and bread. That's close enough, yeah? Moving ahead! Gently mix all of the ingredients in a large bowl. Mix thoroughly, but don't crush it all together. You do not want to compact the mixture. Mix? Like in a bowl? Nobody told me I had to have a bowl. If I put my microwave on its side, can I use that? I don't know that I can do this without compacting but, you know, I'm game. Totally. For whatever you want me to do. Make about 12 meatballs. They will be around 2 inches in diameter. Place on an oiled baking pan and and bake for 15 minutes (20 if you are not going to add them to sauce). Add to tomato sauce and simmer a few minutes before serving. Wait. What? No! What do I DO, Jake?! I don't have any sauce! I'm not simmering! You told me I didn't need sauce, Gyllenhaal!! Oh Jesus. This is awkward. Next time you 'cook,' first go to IKEA and buy a bag of frozen Swedish meatballs. You can heat them in the microwave (if you haven't ruined it with your culinary skill [I use the term loosely] and best of all - the sauce - which is gravy - is optional. Heat, throw in bowl or on a plate & Eat. Serve with or without (instant) mashed potatoes. Except here in Memphis there is NO IKEA! PG + meatballs = doomed. Jake should market his meatballs as "gooberballs." Yey! Jake Watch is back- I was so sad when it ended and I'm so pleased to see you up and running again. Are you back stalking him because he split with Reese? Love your writing - long live this site. I will not even attempt this, i think our cooking skills are pretty much on par PG, if it doesnt come in a box or a can i need VERY specific intructions and even then 90% of the time it ends in disaster. Glad you had a good time with Jake tho! So I'm so glad you found the new site!! I'm still working on brits to come back for a post or two. It's kind of surreal being back, but definitely in a good way! And Sam, thank you for understanding. I just feel like Jake isn't sympathetic to those of us who don't understand loose recipes with unspecific directions... Sigh. Why do I keep having flashes of South Park's Chef's Salty Balls?! Hahaha!! Thought about trying these, but got distracted by the pecorino...! Haha -- meatballs with pecorino! Dang, I need some caffeine!